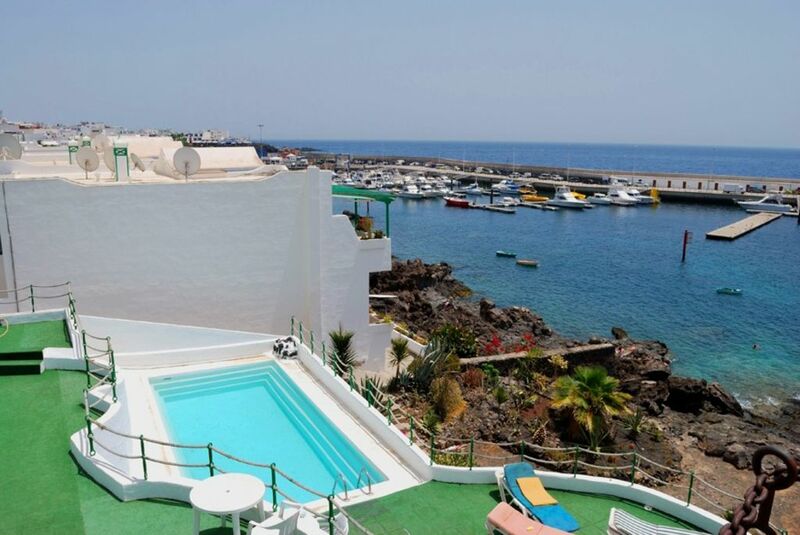 The apartment El Ancla is located at the old fishing harbor of Puerto del Carmen, very quiet apartment complex in El Rincon with community pool. From the large terrace you have an excellent view of the harbor, in 2 minutes you get to the pier on the Create fishermen and offer various excursion boats trips. In the port you will find great restaurants and a still original atmosphere. For the near Playa Chica you can walk in 5 minutes. The beach is popular for many fish that can be seen there especially when divers and snorkelers. For Playa Grande, the 2 km long sandy beach can also come on foot and without parking problems in just 10 minutes. El Ancla is a perfect base to explore this really interesting island. Quiet and beautiful, you can get to know Lanzarote from its traditional side, away from the hotel castles and mass tourism. Wifi is included in the price. The apartment was renovated in 2019 and partly refurbished. We absolutely loved the apartment, the view over the harbour & everything about Tias. The apartment is very well equipped & comfortable. The restaurants & beach at Playa Chica are all in easy walking distance. Warm & friendly welcome on arrival from Christian, plus some complimentary little treats left out for us! Highly recommend. Cant wait to go back. We had a lovely stay, and Christian is very helpful. Apartment is bright and has all you need for two people. Location is good, close to restaurants, supermarket and harbour. Thank you Fiona, we are very happy that you enjoyed your stay. Beautiful location and lovely apartment. Comfortable and well equipped with lovely terrace overlooking the harbour. No oven but everything else you need in the kitchen. Near supermarket and a good selection of restaurants. Christian extremely helpful and quick to help when there was a problem. Great location, lovely terrace, clean and comfortable. Christian who met us was very friendly and helpful. Just back from a relaxing holiday at el ancla apt . The views from the apartment were great . Nice quiet location , but near enough to all amenities . Great restaurants near to the apartment in the Old Town . Added bonus was the good reliable wifi .Air conditioning in the bedroom would have be a great option , but it won't put us off booking again . Christian was a great host , prompt replies provided about any questions that needed answered prior to our arrival . We will definitely return to this apartment . The apartment is clean, tidy and well appointed. It is situated in a quiet location, whilst the Restaurants, Bars and shops in the Old Town are only a short walk away. It has a huge terrace from which to enjoy the stunning views. We would happily recommend the apartment to others. Puerto del Carmen is the most traditional and most popular resort on Lanzarote. Miles and miles of beaches and a complete tourist infrastructure provide the appropriate environment for every type of holiday. From the apartment you have a great view of the old fishing port of Puerto del Carmen, in just 5 minutes walk to Playa Chica, to the 2 km long main beach you walk about 15 minutes.